Uses:- Cymevene Injection is used for the treatment of cytomegalovirus infections in people whose immune system is not working properly. These include people who have AIDS, people who have received organtransplants or people who are having chemotherapy. 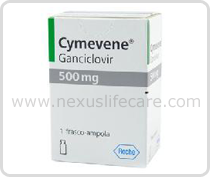 Cymevene Injection is also used to prevent cytomegalovirusdisease in people who are at risk of getting this infection. Cymevene Injection works by slowing the growth and spread of the virus.